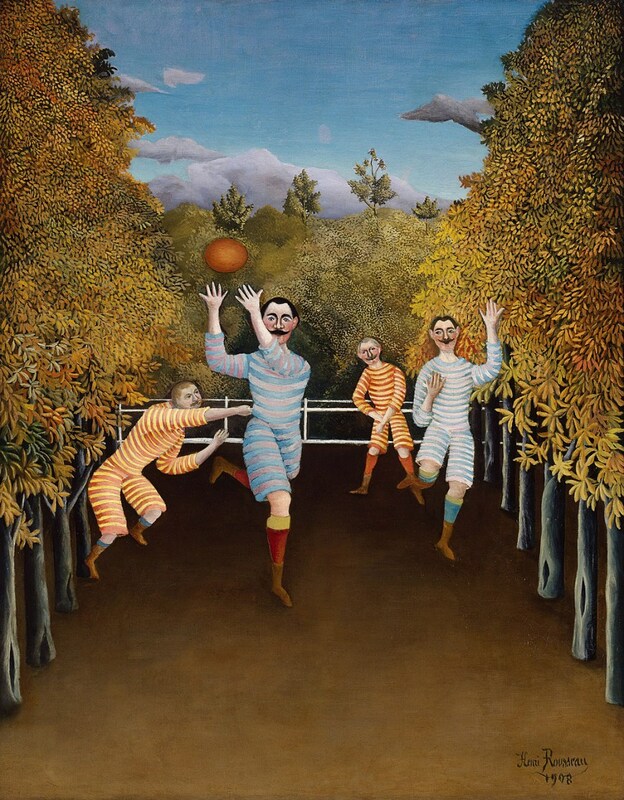 If The Football Players by Henri Rousseau isn’t just the cutest scene of sports ever played, then I don’t know what is. If football games looked more like this, then I might actually watch the Superbowl instead of just bouncing from party to party in search of the best buffalo wings. These men are all in cute little matching striped outfits with matching handlebar mustaches to boot. They are pretty much entirely two dimensional, which in no way detracts from how adorable they are. They even almost look like puppets hanging in front of a backdrop or like they were pasted onto the background after the fact, but that’s only because Rousseau was an entirely self-taught artist who only started doing art full-time in his forties. As soon as he did, he somehow managed to squeeze himself into the art world. And by squeeze himself in, I mean he would barge into dinner parties and exhibitions uninvited. Somehow he fell in with people like Pablo Picasso, Guillaume Apollinaire, Max Beckmann, and Fernand Léger. Members of the Blaue Reiter group like Vasily Kandinsky, Franz Marc, and Paul Klee found him to be super duper inspiring. So much so that when a retrospective of his work was exhibited in Venice, there was an entire group of imitative paintings by the Blaue Reiter group. Basically Rousseau stands proof that confidence can get you anywhere. This painting was almost positively inspired by the first international game of rugby between France and England in 1908. Obviously sports were either a lot less violent or a lot more dangerous back then, based on the lack of padding that these men have on. What a time to be alive! And how better to commemorate such a momentous occasion than with a painting. The meeting of the art and sports worlds is rare, so when they do come together, we must savor it.